A report calls for a new approach to "pelvic health and wellbeing" after surgery using vaginal mesh implants left women in agony. 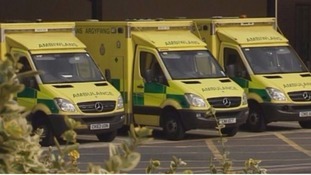 First Minister Carwyn Jones has defended the Welsh Ambulance Service's performance, despite recent cases of patients facing long delays. ITV Wales has been given unrestricted access to an emergency department in Scotland, which is managing to hit its A&E targets. The average Welshman can expect health problems once he's 61, two years younger than the UK figure. For Welsh women, it's 18 months later. There's a "powerful case" that eye treatment targets don't work for patients at risk of going blind, the Health Secretary tells AMs. A new plan has been launched to tackle what's described as one of the greatest health threats facing the country: Antibiotic Resistance. It means bugs aren't killed by antibiotics and so common infections and minor injuries can once again kill. Health boards will develop plans improve infection prevention plans to eliminate avoidable healthcare associated infections in hospitals, nursing homes and other health and social care environments. Health boards will reduce inappropriate antibiotic prescribing and support Antimicrobial Prescribing Teams to promote prudent antibiotic use. The Welsh Government, through Health and Care Research Wales, will prioritise research into antimicrobial resistance. Public Health Wales will improve the data surveillance of antimicrobial resistance and develop an alerts system for real-time identification of resistant organisms. We know that many common and life-threatening infections, such as E.coli bacteraemia – the commonest organism found in blood tests in the UK - are becoming difficult or even impossible to treat. We have to act now. The effectiveness of procedures such as organ transplantation or chemotherapy would be at considerable risk without effective antibiotics being available. The threat is clear – antimicrobial resistance is recognised by the UK Government’s Civil Emergency Risk Register. First Minister Carwyn Jones has told AMs that the Welsh Government will get almost no more money as a result of the UK Government's announcement of extra funding for the English NHS. Increases in England lead to matching percentage increases for Wales under the Barnett Formula but Mr Jones said they'd be cancelled out by cuts in other parts of the English health budget. The First Minister dismissed as naïve a call from the Conservative leader for any extra money to be given to the Welsh NHS. Today the Chancellor has announced £3.8 billion worth of extra money for the English NHS in the next financial year. There will be a Barnett consequential for that uplift. Will you commit to ringfencing that money in the next budget round so that it is put into the Welsh NHS? Is he saying to us today that there will be a full consequential to Wales as a result of the Comprehensive Spending Review? Because our understanding is entirely different. What was being trailed on the radio this morning is that there will be cuts in public health and medical education and that money will be transferred to the NHS budget. There will be no consequential if that happens. So if he thinks there will be a consequential in those circumstances, I'm afraid his naïvety overtakes his perception. An exclusive poll for ITV Cymru Wales shows nearly half of us expect the standard of care in the Welsh NHS to get worse. Welsh voters seem in no doubt that health the is the most important political issue at the moment, according to a YouGov poll for ITV Cymru Wales. Concerns about the NHS are likely to have a big impact on how people vote in the Westminster election, although it's the responsibility of the Welsh Government. Immigration came sixth on 18%, just behind tax on 19%. In general, supporters of all parties broadly agreed about the issues facing the country and themselves. The notable exception was UKIP supporters. 85% of them listed immigration as an issue for the country, more than twice as many as picked any other issue. 50% of UKIP voters also saw immigration as an issue for themselves and their families, again making it their main concern. People could pick up to three issues in response to each question. Poll for ITV Cymru Wales and the Wales Governance Centre at Cardiff University. YouGov poll 24-27 March. Sample of 1189 Welsh adults. Prime Minister David Cameron has said that he'd "plead" with the Welsh Government to increase its spending on the NHS. He was answering a question from the Plaid Cymru MP for Arfon, Hywel Williams. My constituent Mr Irfon Williams of Bangor has been refused the drug treatment for his cancer. He has moved to England and I understand he will begin treatment next Wednesday. What would the Prime Minister say to Mr Williams and others who have had to fight on a case-by-case basis for the treatment prescribed? Mr Williams himself is a senior health care professional. What I would say to Mr Williams is, first, that he has my sympathy and understanding for the condition that he has. I hope he will get the treatment he needs in England. The problem is that in Wales the Labour party has made the wrong decision and cut NHS spending. It did not have to make that decision, because of course the increase in NHS spending in England triggers Barnett money being available in Wales, so even at this late stage I would plead with the Labour Government in Wales: make the right decision on health, increase the spending, increase the cancer treatments, and give people the treatment they deserve. Irfon Willams, who's a mental health service manager in Bangor, will be treated for bowel cancer in Liverpool with the drug Cetuximab, after staying with relatives in Ellesmere Port in order to qualify for the treatment. He's raised over £66,000 to support cancer patients and staff at Ysbyty Gwynedd, where he was previously treated.